Perhaps you have a large tree in your yard that has some long, gangly limbs. You know they need to be cut down, but there is no good or safe way to accomplish this task. You have thought about taking an A-Frame ladder, and attempting to balance yourself on the ladder while holding a chainsaw; however, you quickly realize this activity could turn out to be quite dangerous. Not knowing how to take care of this issue, you visit your local hardware store and see they have the solution to your problem – using a Pole Saw. After looking at them all, though, you might be wondering, what makes the Best Pole Saw in the marketplace? Within this article, we’ll quickly cover some of the qualities of what makes the best pole saw, along with five reviews of highly rated pole saws to help you narrow down the choice of which one will best meet your needs. 1 What are the different types of Pole Saws? Battery Powered – easy and convenient to use and haul around. However, you have to be watchful of the battery life. Electric Powered – Will always provide you a lot of power. However, you have to have at least one long power cord and have to be aware of where the power cord is dangling at all times. Gas powered – They ensure you have the combination of power and convenience. But, fuel does run out, and so you have to make sure you have enough of the right type of fuel on you at all times. The other main components you need to be aware when looking for the best pole saw for you and your needs include the size of the chain with the pole saw. Cordless and electric options tend to have smaller chains on them, making them ideal for smaller trees. The gas powered pole saws will have a larger chain on them to help cut down larger limbs within each tree. In addition to chain size, if you want a pole saw which doesn’t make much noise, then you will need to eliminate the gas powered pole saw option from your choices, as it is the loudest of the three options. If you want an easy to carry and light pole saw, then the electric pole saw is the option you should focus upon. It is the lightest of the three, as you are not hauling around a large battery or a gas tank in addition to the weight of the pole saw. Lastly, the gas powered pole saw requires the most maintenance of the three options, due to it needing both gas and oil in order to run. All of these items should be taken into consideration when it is time to make your choice of which pole saw to purchase. 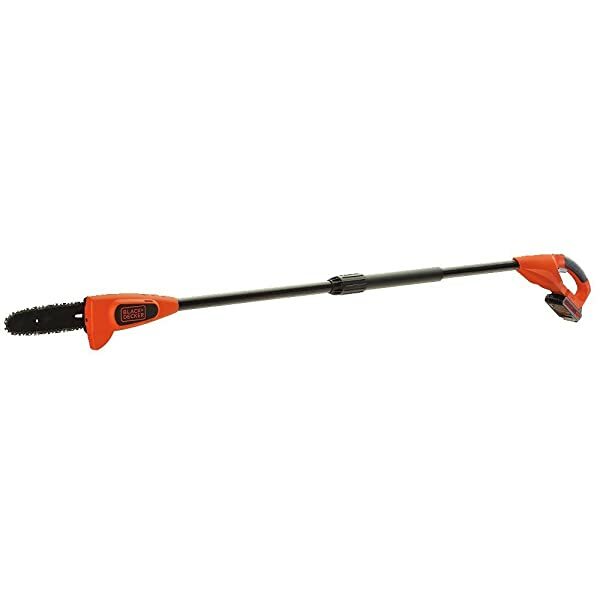 This electric Pole saw comes with an 8-Amp engine, along with a 10-inch blade, allowing you to cut any branches which are medium down to the small size effortlessly. 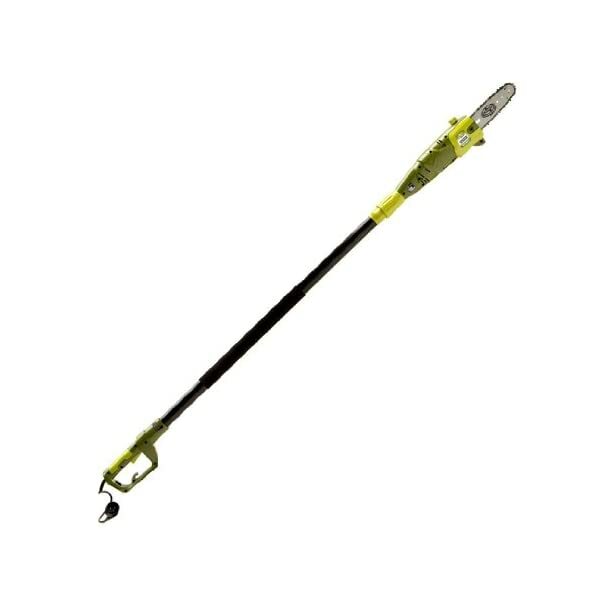 The pole is sturdy enough to allow you to cut branches which are up to 15 feet up off the ground effortlessly. Along the pole, you will see a locking clamp, which means you can adjust the length of the pole saw simply and easily, once you have determined what the length needs to be. In addition to the clamp, this saw comes with a grip which is made from a non-slip component, so you can be assured that the pole will not slip out of your hands at an inopportune time. Detaching the chainsaw from the pole uncomplicated, so you can actually use the chainsaw to help with any work which needs to be done on the ground level. A combo unit allowing you to use this as a chainsaw and a pole saw, meaning you can have two tools within one operating unit. Along the chainsaw, you will see a 10-inch bar and chain, which will allow you to cut larger limbs with ease. 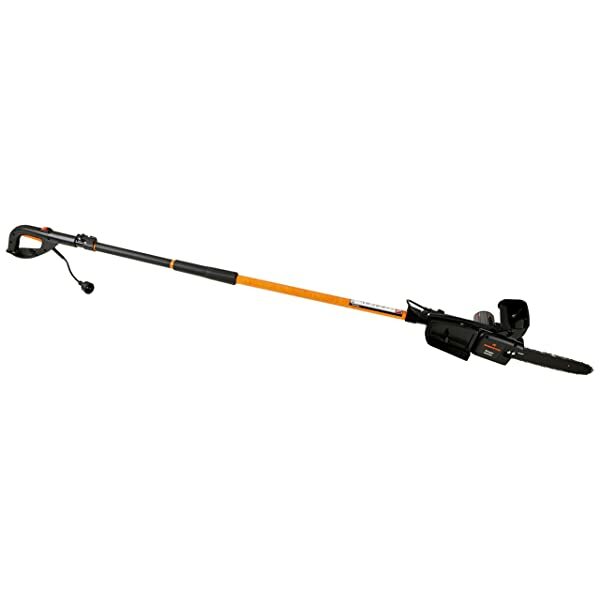 This electric pole saw comes with a telescoping pole, which allows you to cut branches which are anywhere from 10 to 15 feet above the ground. Along the pole, you will feel a grip which is made from the non-slip material. This material is very comfortable to hold onto, so your hands will not cramp up. When you adjust the pole, there is easy to use clamp so you can secure the length of the pole when it reaches the desired height. 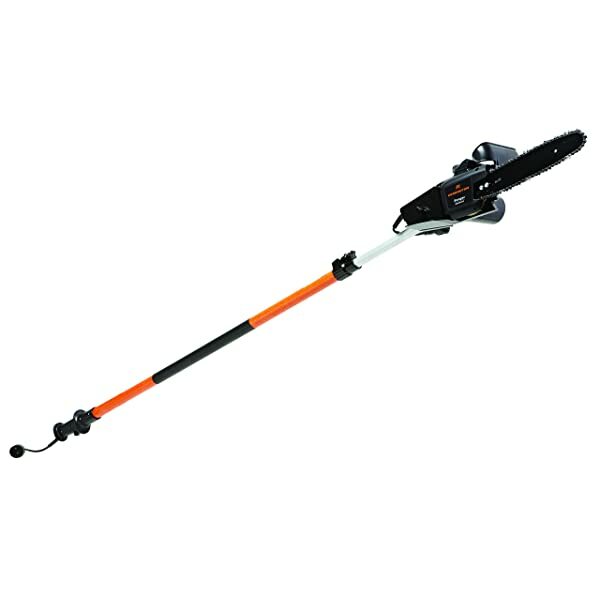 This battery powered pole saw from Black and Decker is operated off of a very powerful NiCad battery, while also providing 20 Volts of power. The length of the chain is eight inches, allowing you the ability to cut medium sized and smaller branches. The extension of the pole allows the length to be up to 10 feet, meaning you should be able to cut branches which are up to 14 feet off the ground, on average. The battery life is quite long, allowing you to cut 1 ½” thick or smaller branches with ease, up to 100 of these kinds of branches per charge. The pole saw is very painless to disassemble, so you can transport it or store it away when needed. This Pole saw weighs less than 6.5 pounds. This electric pole saw has a telescoping pole which can extend out to 8 ½ feet; this capability allows you to feel comfortable cutting cut limbs which are up to 15 feet off the ground. The chainsaw part of this pole saw has an 8-inch bar on it, meaning it can cut logs which are 7.5” thick or smaller. Along with these features, this pole saw comes with an auto-oiler system, which helps keep the chain and the bar lubricated during use, Although this pole saw is electric, there is a safety switch included so you can be assured this pole saw will not accidently start up until you are ready to use it. This pole saw also comes with a 2-year warranty. 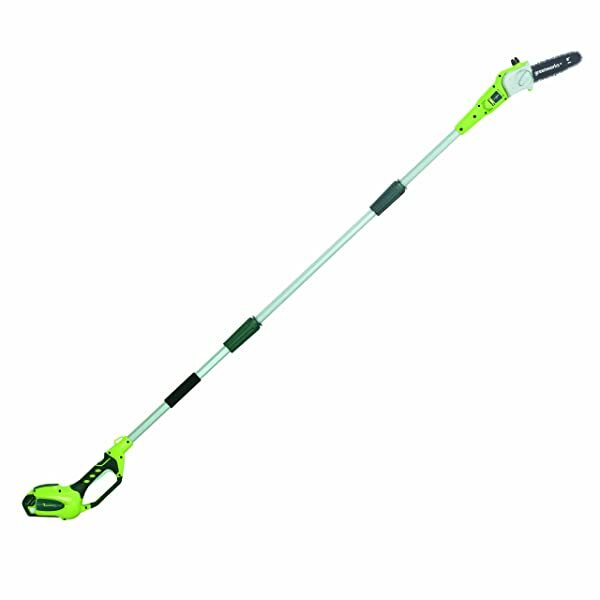 GreenWorks has this battery powered pole saw for you to consider for your needs, as it comes with a very powerful 40-volt battery made out of a Li-Ion material. You will receive the battery and the charger with this package, so you can make sure your battery is always fully charged for when you need it. This pole saw comes with a pole which can range out to 8 feet long, allowing you to cut branches which are up to 13 feet off the ground. The chainsaw itself comes with an 8-inch chain and bar, so you can cut branches which are up to 7.5 inches thick. You can effortlessly change the tension system on the chainsaw so you can decrease or increase the tension as needed. This pole saw comes with a self-maintaining auto-oiler system, should ease your mind when it comes to maintenance. When it comes to finding the best pole saw within the marketplace, there are many options for you to decide from and narrow down. Whether you go with a gas, electric or battery powered pole saw, or if you are intrigued by a combo kit, you can be assured you can find a model which will work best for you.